Cities in a number of Asian countries, including China, Hong Kong, India, Indonesia, Nepal, Pakistan, the Philippines, Singapore and Taiwan, are currently on the warpath against plastic shopping bags. The cities have passed local laws that ban such bags, on the basis that they clog sewers and drainage canals, cause street flooding, choke animals and are responsible for other forms of environmental damage. China and Taiwan, for example, impose heavy fines on violators. Other countries are appealing for a switch to the production and use of biodegradable bags. But this misses the point. People do not object to using biodegradable bags, and consider them a welcome return to the traditional practice of using shopping baskets and bags made from locally available materials — such as jute, abaca and cloth — that are less harmful to the environment. What needs to be remembered is that plastic bags were made for a purpose, and that the main complaint is against the way that they are used — not their existence. Plastic bags were designed to satisfy a need. Thin plastic can do many things that paper, which is recommended as a good substitute for plastic, cannot. Indeed, there are ways in which thin plastic may be more useful than paper. For example, plastic bags are widely appreciated for their use in wrapping food, and holding water and other wet goods. They are also useful as a protective lining for rubbish bins, as a protective wrap for delicate clothing material, or as a way of temporarily sealing roof and tap leaks. These and many other functions make the plastic bag a versatile, practical invention of the twentieth century. Another advantage of the plastic bag is that it is reusable. Although some plastic bags are too thin for reuse, the solution is to manufacture stronger and more durable plastic film bags, not discard them altogether. manufactured from a biodegradable material — such as the bioplastics that are now being produced in some European countries — the main reason for banning them would disappear. Even with a change of material, however, there is no guarantee that environmental damage from plastics would stop. This is because the ‘evil’ is not in the material used, but in the behaviour of those who do not know — or do not care — where, when and how to dispose of the product. Moreover, governments cannot ignore the contribution to the economy of the thin plastics industry. Australia, for example, has decided to reduce the use of HPDE (high-density polyethylene) thin plastic bags but not ban them because of the negative impact it would have on employment. According to the Worldwatch Institute, the plastics industry similarly generates hundreds of thousands of jobs in China, Malaysia and Thailand, which in 2005 jointly exported to the 239 million tonnes of plastic bags — worth US$108 million — to the United States. The answer to the problems associated with thin plastic bag use is not a ban, but better management. 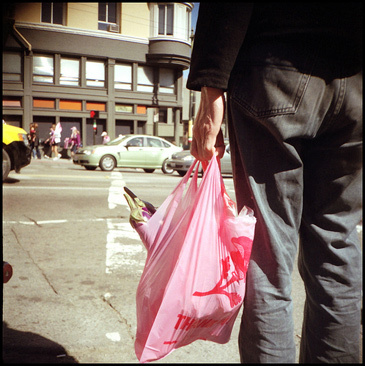 The 3Rs — reduce, reuse and recycle — of solid waste management (SWM) also apply to plastic bags. But only a few countries in Asia have sound SWM systems, even though all of them have regulations on solid waste. This is a result of a general misconception that managing is the same as regulating. Managing plastic bags means knowing how to use and store them properly so that they can be reused many times, and knowing how they can be recycled when their useful life has come to an end. Guidelines on how to use, maintain, reuse, recover and recycle plastic bags are necessary, and recycling technologies for thin plastic bags are now widely available. The guidelines should extend to the application of appropriate technologies for disposal when the materials have reached their ultimate limit for reuse and recycling. Many materials need to be managed if they are not to harm the environment. Indeed, if not properly managed, paper can be a worse polluter than plastic bags; it occupies nine times as much space in landfills, and does not break down substantially faster than plastic. According to the US Environmental Protection Agency, paper bags generate 70 per cent more air pollutants and 50 times more water pollutants than plastic bags, because four times as much energy is required to produce them and 85 times as much energy to recycle them. Indeed, as with anything that is designed for a purpose, both paper and plastic bags need to be managed to sustain their usefulness and prevent them from disrupting the balance in our ecosystems. Regulating the use of plastic bags is necessary. But regulations are not enough; their enforcement is more important. Banning plastic bags dismisses them as useless, and disregards their practical functionality, durability and affordability. It is the misuse and improper disposal of plastic bags that is causing harm to the environment, not the product itself. A total ban on plastic bags will only gloss over the lack of an effective environmental management policy in a given country. It will not save the environment from the ill-effects of a ‘throw-away’ mentality.